The 2013 Festival season is shaping up the be one of the busiest ever. With events taking place from the Pacific Northwest to Miami Beach, there is a line-up and location that appeals to just about everyone. 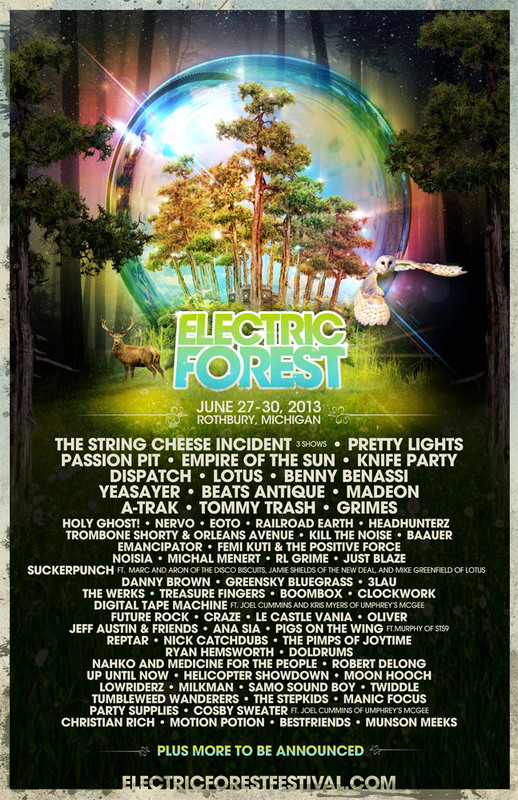 One event that really stands out from the crowd is Electric Forest which will be taking place from June 27-30th. The multi-day camping festival (with many VIP options ranging from safari tents, to cabins, to condos) is back in Rothbury, Michigan in 2013 with a stellar multi-genre line-up of DJ’s and bands featuring three sets by The String Cheese Incident, and other headliners like Pretty Lights, Passion Pit, Empire of the Sun, and Knife Party. The line-up is fantastic but it’s the setting that must be experienced first hand to be believed. The Sherwood Forest, located in the heart of the festival, is a great place to lay in a hammock and relax during the day. At night, the Sherwood Forest comes alive with an extravagant light display, surprise performances, and parties in the depths of the woods. There is also Big Wildcat Lake for those seeking the beach and BBQ experience. For those wishing to add even more to their stay, there is a gigantic indoor water park, a magnificent golf course, and horseback riding available for a discounted fee. Only the final pricing tier of general admission tickets is still available before Electric Forest so we highly suggest that you buy your ticket immediately so you can join in this one of a kind experience. Independent Philly will be there to capture all of the magic for you with daily recaps, photo galleries, and interviews and we hope you’ll join us!